This is one of the recurring themes of my technomadics… machines that opened some of the most amazing doors. 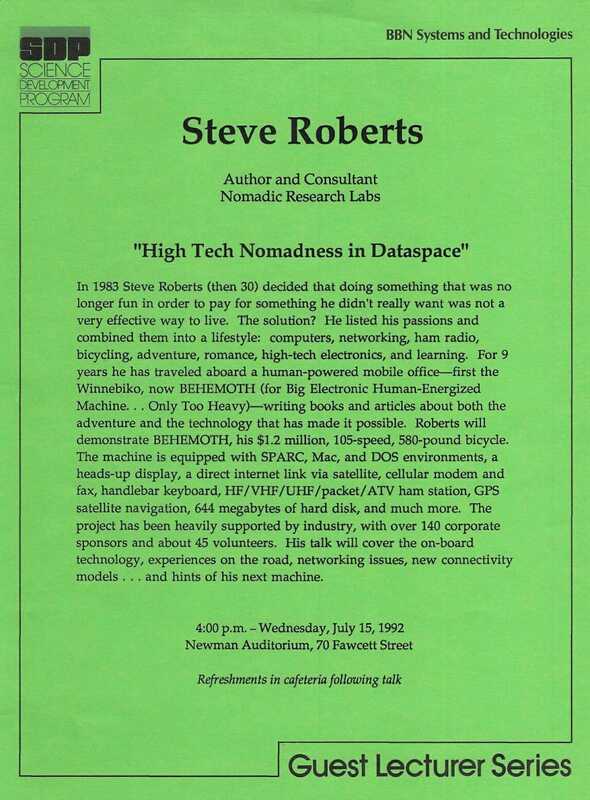 It was an honor, during three successive days in 1992, to speak at BBN, Thinking Machines, and MIT Media Lab. BBN (originally Bolt, Beranek and Newman and now part of Raytheon) was best known in the old days for developing the packet switching technology that formed Arpanet and this Internet that we all take for granted. You can read more about them here, or a LOT more about them in this PDF. Anyway, speaking there was a hoot, as you might imagine… it was a hotbed of übergeekery, and with an audience like that, I didn’t have to translate at all. The technical details and puns came fast and furious. This is one of very few videos I have of BEHEMOTH walkthroughs, and I’m glad I was in an environment where I did not have to translate. It’s a digitized dub-of-a-dub, so video quality is poor, but it’s fun anyway. 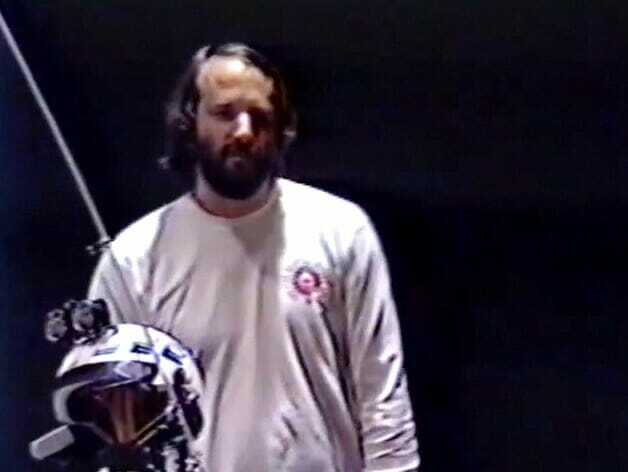 In 1983 Steve Roberts (then 30) decided that doing something that was no longer fun in order to pay for something he didn’t really want was not a very effective way to live. The solution? He listed his passions and combined them into a lifestyle: computers, networking, ham radio, bicycling, adventure, romance, high-tech electronics, and learning. For 9 years he has traveled aboard a human-powered mobile office — first the Winnebiko, now BEHEMOTH (for Big Electronic Human-Energized Machine. . . Only Too Heavy) — writing books and articles about both the adventure and the technology that has made it possible. Roberts will demonstrate BEHEMOTH, his $1.2 million, 105-speed, 580-pound bicycle. The machine is equipped with SPARC, Mac, and DOS environments, a heads-up display, a direct internet link via satellite, cellular modem and fax, handlebar keyboard, HF/VHF/UHF/packet/ATV ham station, GPS satellite navigation, 644 megabytes of hard disk, and much more. The project has been heavily supported by industry, with over 140 corporate sponsors and about 45 volunteers. His talk will cover the on-board technology, experiences on the road, networking issues, new connectivity models . . . and hints of his next machine.